Ropes Challenge Course Vs. Adventure Park­—What’s the Difference? With the growing popularity of aerial adventure parks sweeping the nation, the benefits of a traditional ropes challenge course teambuilding program become even more difficult to explain. To the uninitiated, the ropes course and the adventure park look very much the same—in fact, the adventure park sometimes looks more fun! There are some distinct differences that should be clearly understood for clients to make an educated decision for their group’s teambuilding endeavors. 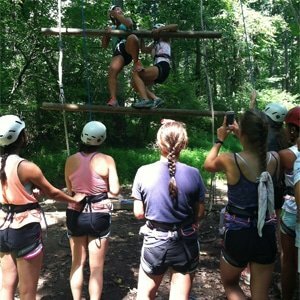 What is a ropes challenge course? The ropes challenge course is a tool for increasing vulnerability-based trust among members of a group. Teams, office groups, student organizations and others have benefitted from spending the day out on a ropes course working on enhancing their communication, solving interpersonal relationship issues, and learning tools for increasing innovation and process improvement. The ropes challenge course program uses problem-solving activities as a laboratory for exploring the challenges we face within an organization. This project-based approach gives us an opportunity to discuss group dynamics and the ways that we work together. Following the low ropes activities, the team often transfers to the high elements and puts their trust to the test by asking participants to belay and keep one another safe. At the root of all these activities and discussions is the belief that trust is the key to successful organizations and that a ropes course gives a crash-course in building trust.overcome those challenges and to learn from the process. Much of this learning takes place on the ground, through the use of team building activities that are part game, part goals-driven discussion. If I had to compare a ropes course to another adventure activity, I’d say even the most basic and recreational ropes course program is similar to a good day of whitewater rafting. You need other people to help you steer your raft safely down the river. There is a guide nudging your team either toward or away from a challenge, introducing the skills you need to work together and get down the river safely. Effective communication is critical to successfully maneuvering your raft, and when teams are not effective there can be unexpected results: flipping or pinning your raft, ejecting participants over the side of the boat, etc. Yes, a ropes course teambuilding event is very much like a good day of whitewater rafting. An aerial adventure park is specifically designed as an individual challenge—teambuilding is not the focus. Participants enjoying an adventure park experience will traverse, zip, climb and engage in many of the “high element” activities made famous by the traditional ropes course program, but will rarely, if ever, engage in any true teambuilding. I recently ran a training for a company that wanted to include its adventure park as part of its teambuilding program and we had a great deal of difficulty finding anything in the adventure park that remotely resembled teambuilding. Participants in an adventure park are harnessed up and learn how to connect to the safety cables, transfer from one element to the next at platforms and individually cross from one challenge to the next. For most participants, there is a great deal of physical challenge; many adventure parks are set up with beginner to advanced level “trails” similar to a ski resort. While it can be a lot of fun, would you consider skiing a “teambuilding” activity? You may take a short ski lesson or ski with a friend, but you are always relying on yourself, not on anyone else. That is very much the experience at an adventure park. You might have a blast, but it isn’t teambuilding. 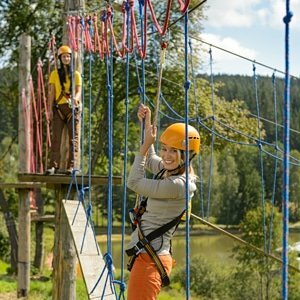 While there is an option to have a recreational fun day on a ropes course, with no specific teambuilding lesson, you can’t have a true teambuilding experience in an aerial adventure park. They may look the same from the ground, but they are as different as skiing and rafting.